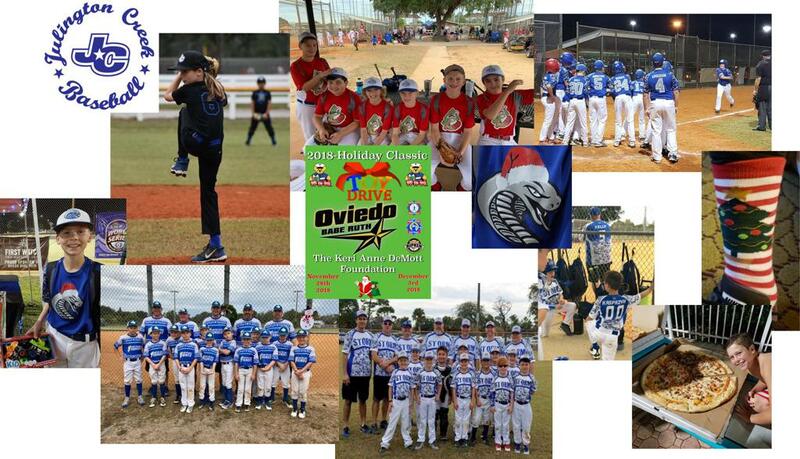 Julington Creek Baseball (JCB) sent six Advance Baseball (AB) recreational teams to the 2018 Oviedo Holiday Tournament in Orlando, Florida (8U Storm, 9U Bombers, 9U Thunder, 10U Bandits, 11U team, and 12U Cobras). The holiday tournament supports the Keri Anne DeMott Foundation. Several JCB players and their families donated unwrapped toys to the Toys-for-Tots organization. After Saturday’s elimination rounds, the parents, players and their siblings celebrated holiday spirit at the hotel with 30” pizzas, hotel tag, swimming, and watching college football in the lobby of the hotel. It was a great time with the JCB families. JCB’s annual attendance at this tournament is a testament to our recreation AB teams’ giving spirit and competitiveness.